Bob Harmsen, who sponsored local through national level racers in multiple forms of motorsports competition under the auspices of his Jolly Rancher Candy Company. 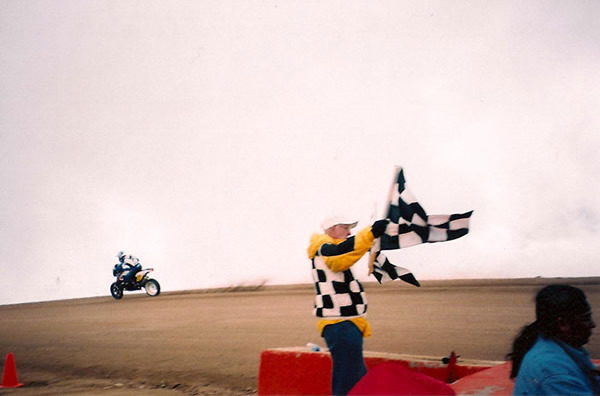 A lifelong devotee of nearly any form of motorized competition, Bob has provided support to racing facilities, sanctioning bodies, and motorsports organizations throughout the region, including the establishment of the Colorado Motorsports Hall of Fame. John Pugh has painted, lettered, and designed the visual presence of over 1000 race cars on a national level over the past 47 years. In addition to designing and executing some of the most instantly recognizable paint schemes in drag racing and oval track competition, he is also widely recognized for creating racing themed lithographic art and t-shirt designs. Tom Vanswearingen received a 2018 Jerry Van Dyke Award for contributions made to Colorado Motorsports during his 50 years of involvement in racing as an event announcer, pit steward, and race official for numerous organizations and race tracks. 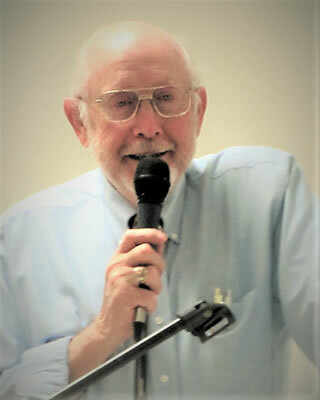 Tom was the announcer for the RPM Sprint Car series in the early 70’s, and continued to announce events for Midget, Sprint Car, USAC Silver Crown, and Stock Car racing at tracks throughout the region for over 30 years. Most fans knew him from his work at Lakeside Speedway, Colorado National Speedway, and Rocky Mountain National Speedway, where he worked alongside legendary announcers Jerry Van Dyke, Mitch Miller, and Mark Woodward. As an event announcer, Tom did far more than simply provide facts. Through his vast knowledge of the sport, his personal interactions with the drivers and teams in competition, and his unforgettable ability to connect with fans and the racing community, Tom was able to provide insights into what was transpiring at the track and create an experience that was unforgettable for fans in the stands. When it came to race day, Tom was always willing to do whatever he could to make and event successful, whether it was in the booth, in the pits, or on the track. Tom would most often be seen before the beginning of these events, interviewing drivers, crews, and officials, looking for bits of information and insight he could pass along to his audience. He was the ultimate friend to the sport: part official, part reporter, always an enthusiastic and knowledgeable promoter of racing. The Colorado Motorsports Hall of Fame is pleased to recognize Tom Van Swearingen’s lifetime contributions to the sport of auto racing and his passionate dedication to make a days at the races memorable for everyone by awarding the Jerry Van Dyke Award to him as a part of the class of 2018. Bill Ray has been selected to receive a Jerry Van Dyke award in recognition of his 57 year career supporting Colorado Motorsports. His interests began watching stock car racing at Macon County Speedway in Decatur, Illinois. 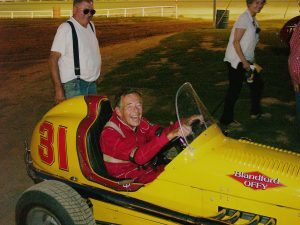 After moving to Colorado in 1953, he watched the races at Englewood Speedway until he was old enough to enter the pits. He was introduced to Jim Opperman, and joined his pit crew. 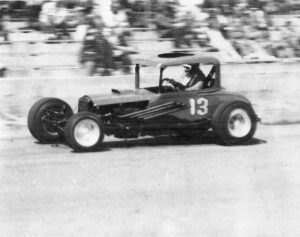 Bill eventually bought his own car and competed in the modified division from 1962 to 1978, racing against Joe Lehman, Jim Opperman, Jim Venable, and other notable and stout competitors. While Englewood Speedway remained his favorite track, he also raced at speedways such Lakeside, Colorado Springs, and Pueblo in Colorado, as well as tracks in Benkelman, Nebraska, Cheyenne, Wyoming, and Oklahoma City. He says two memorable events in his career were “getting upside down while running over someone’s tire at Englewood”, and “breaking a steering arm, which led to running into an outhouse in Benkelman”. In addition to his time on the track, Bill served as Englewood Racing association president from 1966-1978. He also served as pit steward for a total of 23 years at Englewood Speedway and Colorado National Speedway, during which time he worked for track owners Richard Codner, George Butland, Jim Opperman, and Marshall Chesrown. Bill has said he did his best to run good, fast pit programs at the races, and always tried to be considerate of others. Those who participated in those events know that Bill succeeded in meeting those goals, and were able to depend on him to run things professionally and fairly. Bill Ray earned much praise and respect for his dedication to oval track racing in his long and accomplished career, and his efforts are saluted with the 2018 Jerry Van Dyke Award. For over 50 years, Beck Bechtelheimer has served the racing community with distinction as an announcer for races that have been held at nearly every track in the southern Colorado region. After his start at Pikes Peak Speedway in the 1960’s, he was the starting line radio announcer for the Pikes Peak Hill Climb for 49 years. 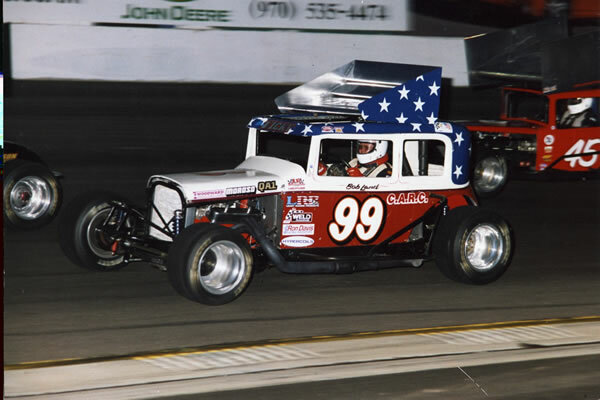 In addition to a 52 years of continuous competition as a driver in the Colorado Auto Racing Club, Bob Land’s racing career has consisted of fielding cars for other competitors, serving multiple years as club president and member of the CARC board of directors, and becoming one of the more visible and active members of the Colorado racing community. The recipient of the 2016 Jerry Van Dyke Award, which is given as recognition for contributions to Colorado Motorsports by an individual, is Gray Brumfield for his decades-long commitment to supporting Sports Car Club of America events and operations. Gray began his involvement in road racing in 1953, when one of his co-workers at Bell Telephone Laboratories in New Jersey was building a race car and invited him to attend races at Bridgehampton Raceway. Though this was his first race, he knew he was hooked! He applied to the SCCA and was accepted. His race involvement consisted of some pit crew work and watching the races, one of which included a young Roger Penske in an MG-TC. In 1955, an official asked him to serve as a corner marshal by saying “you look bored, how about helping me? Take this yellow flag, go up the hill and display it if somebody spins or stalls on the course.” It was the beginning of 50-plus years of being part of the flagging and communications specialty so integral to SCCA events. Gray was bitten by the racing bug, and in 1957 purchased a 1955 MG-TF, attended driver’s school, and received his competition license. His driving career was comparatively brief, however, when seen alongside his ongoing work toward developing safety and on-track communication programs within the SCCA organization. He helped form a training program for track workers, as well as the development of a national standard for corner flag use that is the basis for contemporary flagging practice. A racing accident that left him severely injured in 1958 convinced him of the need to provide greater protection for corner workers, and he was instrumental in developing designs of corner bunkers to shield flaggers from spinning race cars that have evolved to the stringent standards used at tracks across the country today. A job opportunity brought Gray to Colorado in 1969. After searching out the local SCCA chapter, he joined the region’s club as they lost one of their track, the beautiful Continental Divide Raceway. He helped locate another facility is Aspen, only to lose it after a few years. The group then converted and abandoned airport in La Junta for racing use, and over the years coordinated SCCA activities with Second Creek Raceway, Pueblo Raceway, Mead Raceway, and Pikes Peak Raceway. 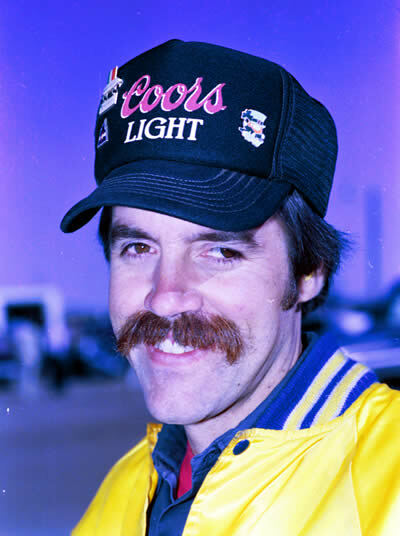 Most recently, Gray became one of the principal figures involved in the building and operation of High Plains Raceway, located near Byers, Colorado. This state-of-the-art facility has many of the safety features Gray has championed over his long involvement with road racing, including substantial safety bunkers on each corner to protect flaggers who are there to maintain control and safe racing communication. While Gray has stepped back from corner work at road races these days, he is still active in race communications at various racing events, and continues his 60+ years of significant contribution to motor racing. He is a most deserving recipient of one of Colorado Motorsports Hall of Fame’s most prestigious awards! Pete Brandenburg has been chosen to receive the 2015 Jerry Van Dyke Award, which is given in recognition of lifelong dedication to Colorado Motorsports by an individual. 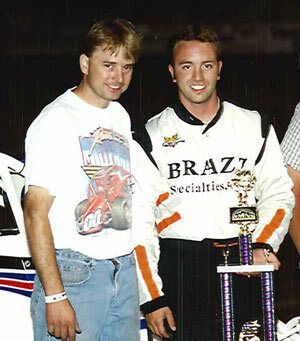 Pete began racing at Lakeside Speedway at age 21, and over the course of his racing career he was competitive in figure eights, modifieds, late models and midgets. His award acknowledges his dedicated involvement in racing organizations and clubs. He has been on the Englewood Racing Association Board of Directors, RMMRA Board of Directors, and the Colorado Motorsports Hall of Fame board of directors. He also has been recognized with lifetime memberships in the Arapahoe Racing Association and Englewood Racing Association. Through his sign-painting business, Pete has provided banners, signs, decals and other promotional tools to the organizations and clubs of which he has been a part. Pete has been an energetic and active member of the racing community for decades. As 2015 Jerry Van Dyke Award recipient , Rob Johnson, said: “Pete and Jerry Van Dyke played an enormous role in creating the CMHOF, and then finding a way to kick start it again 20 years ago. We wouldn’t have the country’s premier state motorsports hall of fame if it weren’t for dedicated folks like Pete. I loved his passion for motorsports and our country. We should be proud to carry on the legacy that these guys created. ” Pete Brandenberg passed away on February 1, 2018. A Colorado native, Rob Johnson has spent much of his 25+ year professional career in sports management positions up and down the Front Range of the Rockies. After graduating from the University of Colorado with a journalism degree in 1990, he ventured to Kansas City to work for a leading advertising and public relations firm, Barkley & Evergreen Advertising, on motorsports and finance accounts. There, he managed public relations and advertising projects on behalf of Purolator Filters, Western Auto and AE Clevite Engine Parts. Upon returning to his hometown in 1994, he helped with the start-up of several marketing firms, ultimately becoming the manager of the public relations division of the Denver-based strategic marketing firm of Greenberg Baron Simon & Miller. There he worked for such clients as Pepsi Center, Colorado Avalanche, MLB’s ’98 All-Star Game at Coors Field, and Turner Sports’ Atlanta Arena, and as one of the initial strategic marketing and public relations consultants on Pikes Peak International Raceway, a 1,200-acre, 42,000-seat complex built in 1996 in Fountain, Colorado. In November 1998, Rob was named president of Pikes Peak International Raceway where for eight years he oversaw a major motorsports calendar, including NASCAR, IndyCar, AMA and USAC and more than 100 days of additional track rental activities. In 2006, he became general manager of the Grand Prix of Denver, a Champ Car street race held on the streets of Denver. He was also named vice president of Sutton International Motorsports, where he managed sales, marketing and public relations initiatives for the organization’s NASCAR, Baja and Champ Car projects. In addition, Rob has served as the race director for the Shell Eco-Marathon for the past eight years. In this role, he oversees a fuel mileage competition of more than 150 high school and college teams from around the world. The event is currently held on the streets of Detroit. He has also managed the event in California and Texas. Outside of racing, Rob is currently the chief executive officer of the Billiard Congress of America, a non-profit trade organization dedicated to promoting the game of billiards though educational, marketing and promotional efforts, annual industry trade shows, tournaments and other programs designed to encourage play. He is also the managing director of a non-profit association and conference management firm. Rob has also been actively involved in the community, having served on the board of directors for 10 years, including six as chairman of the board, of the Colorado Motorsports Hall of Fame. He has also served on the board of directors for the Pikes Peak International Hill Climb, University of Colorado Alumni Association, Fort Carson Educational Museum and University of Colorado at Colorado Springs Chancellor’s Leadership Class. Rob, his wife, Kari, and their three boys live in Superior, Colo. The board selected Mark Matejka to be the recipient of the 2014 Jerry Van Dyke Memorial Award, recognizing outstanding contribution to motorsports by an individual. Mark began his career as a driver, mechanic and crew chief in 1985. It was his skill as a mechanic that made Mark one of the most respected men in the pits. During his career, Mark won 12 Rocky Mountain Midget Racing Association “Championship Mechanic Awards.” He won the RMMRA’s “Mechanic of the Year” award seven times and he was awarded the ASCS Rocky Mountain Region Championship Mechanic for Sprint Cars in 2005. Drivers for which he served as chief mechanic include Randy Roberts, Dave Strickland, Greg Shaefer, Keith Rauch, Gary Taylor, Kenny Lewis, Derrick Ortega, Todd Plemons, and Bobby Seals. He won RMMRA Season Championships with Roberts, Rauch, Taylor and Lewis. Owners for which he worked include Harry Conklin, Lynn Jacobs, Cindy Roberts and Frank Peterson. Don Styes had an interest in motorsports from an early age. He was born and raised in Englewood and was attracted to Englewood Speedway from the time it was built, first as a spectator, then as a racer and later through many official capacities. In 1953, he was on the pit crew for car number 74 and tried his hand as a driver. Once he was involved in an accident and rolled a car from turn two and nearly the length of the back straight. This mishap did not dampen his spirit. 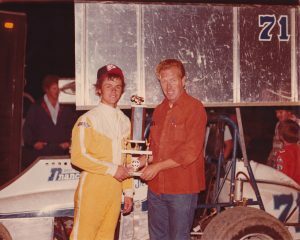 The next year he and Bob Weeks became co-owners of car 73. Don drove the car and shared the mechanical duties with Bob. This partnership lasted two years, but the demands of work and being a father took their toll and resulted in the pair selling the car. 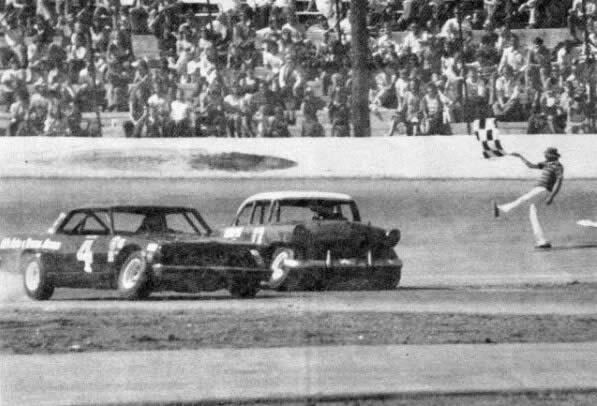 Later, he returned to being a co-owner and driver of car number 74, this time with his brother-in-law, Bill Nordeen. This endeavor was also short lived, lasting just one year. After his career as a racer, Don continued to support racing and remained a part of the racing scene. For many years, he performed various roles in the Rocky Mountain Stock Car Racing Association (RMSCRA) and Englewood Racing Association (ERA). Later, he went on to become a well-known flagman. In the RMSCRA, Don was hired as a judge, Executive Secretary, Treasurer and was elected President three times. As President he introduced the use of Robert’s Rules of Order for all meetings. In 1960 he was instrumental in guiding the organization through all the changes that occurred after the track was paved. When ERA was formed in 1965, Don was elected President four times (1968, 69, 71& 75) and continued to lead the organization through the changing times of the ever-evolving modified cars and the figure-eight cars. While both divisions became faster, he continually worked with board members and tech committee members to increase safety. Milestones of his leadership included ensuring there was little delay between events at each race and making sure each segment of the show was carried out with efficiency and professionalism. He also strived to make sure RMSCRA and ERA were well represented at public events, primarily the Saber’s Hot Rod Show and the St. Patrick’s Day parade. Another of his priorities was to continually work with the Denver Post and Rocky Mountain News sports department writers to gain recognition for local racing. His work proved beneficial as several articles featuring owners and drivers were published in the newspapers. Following his driving career and officiating careers, he went on to become one of the most well-known flagmen in Colorado motorsports and was recognized for his no-nonsense attitude and showy style. He flagged races featuring motorcycles, midgets, modifieds, late models, figure-eights, chargers and mini stocks. He served as a flagman for Englewood Speedway, Lakeside Speedway and Colorado National Speedway. Don passed away in 1995. His example of sportsmanship, fairness, integrity – and of course his eye for safety – continues throughout his family’s racing endeavors and commitment to the racing community. Johnny Haberman became an active member of the Colorado Automobile Racing Club in 1953. In his early years, he served as a top notch pitman and goodwill ambassador for Fritz Wilson. In 1963, he became a flagman and Lakeside Speedway, and over the years earned the reputation for being an outstanding flagman and ambassador for Lakeside Speedway. The board selected veteran motorsports journalist Scott Stocker to be the recipient of the Jerry Van Dyke Memorial Award, recognizing outstanding contribution to motorsports by an individual. 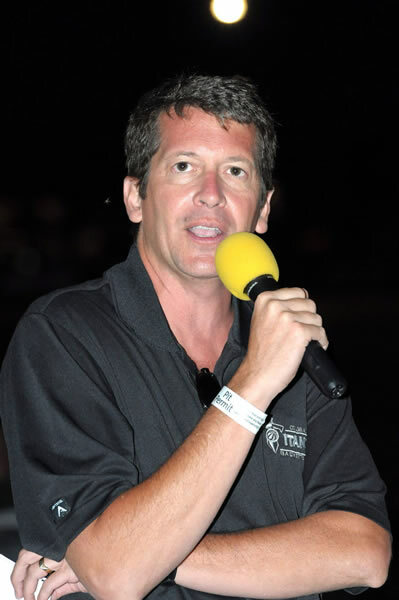 As a journalist, Scott has received numerous awards for his outstanding work, including being named the 1998 NHRA, Division V, “Mogul Writer of the Year” and being elected in 2004 to the Colorado High School Activities Association Hall of Fame. Scott is currently a sports reporter for the Metro North News, Max Preps, Colorado Sports Insider/Preps and other publications. From 1986 to 2009, he was a sports columnist and reporter for the Rocky Mountain News. It is during this time that Scott earned a reputation for being one of the top motorsports reporters in the state. As such, he worked hard to promote all angles of the sport and brought significant statewide publicity to Colorado motorsports. From 1972 to 1986, he was a contributor to Denver Post, Rocky Mountain News, AP News Services, UPI News Services and various in-state publications. In addition to his journalism background, he has worked in the medical field, both for the US Army and the private side. He also served as a basketball official. He received his BA in education and history from the University of Colorado. The board selected veteran motorsports photographer Joe Starr to be the recipient of the Jerry Van Dyke Memorial Award, recognizing outstanding contribution to motorsports by an individual. Joe Starr was born in San Diego, California and attended his first race at one week old. He got his racing bug from his family who attended midget races in the 1940s and 50s in California and Colorado. His uncle, Jimmy, competed in many of the first midget races he witnessed. Upon his dad’s retirement from the Navy, the family moved to Colorado in 1957. From the summer of 1967 every Saturday night it was either Englewood Speedway or Colorado National Speedway and then on Sunday it was Englewood Speedway or Lakeside Speedway. In the fall of 1974 Joe bought his first camera with no thought of ever taking photos of race cars. He took the camera with him on a trip to Kansas City for a race at I-70 Speedway. Not knowing any better, he walked thru the back gate into the infield and shot some photos and then went back into the grandstand. He had no idea that he needed a pit pass to be in the infield. Veteran race driver Don Woodard saw some of the photos he had taken and asked him to shoot some things for his business, Woodard Racing Graphics. He was taking many photos but was hesitant to actually speak to the people that he had photographed. He was helping Don Daly and Larry Keir at Englewood Speedway on Saturday nights. They literally forced him to speak with some of the drivers and show them the photos he had taken. One of those drivers was Paul Garrison who was promoting the Erie Innovational once a year at Colorado National Speedway. Much to his surprise in 1980 Paul asked Joe to photograph the race because the regular photographer at CNS was not available for his race. The photographer job at CNS became available for the 1981 season and George Butland called Don Woodard and asked if he knew anyone that could take on the job. Don sent Joe over to speak with George and he stared as the photographer at CNS in 1981. As a result of his successful career, many of Joe’s images have been published in numerous racing related publications across the country, and as a result of that, he has been able to attend many national events including NASCAR, World of Outlaws, Indy Racing, USAC and many others to numerous to count. In 1986 Gary Garrison asked Joe to help him with a radio show he was putting together to try and help secure some sponsorship for his race car. That has lead to doing radio off and on ever since with a multitude of people that continues to this day. After getting many requests to view the images that he had taken on line Joe got together with Eric Guttormson and started Big West Racing in 2002. Their philosophy has always been to present a positive face to racing. Joe retired from the US Postal Service as an Operations Support Specialist in May, 2008 with 35+ years of service. At the 2010 Colorado National Speedway Banquet, the Speedway Officials inducted Joe into the Colorado National Speedway Hall of Fame. Joe continues to gather images at Colorado National Speedway and many other racing venues and to provide local racing information to a variety of local and national media sources. The board selected veteran Pikes Peak International Hill Climb flagman, Art Walsh, to be the first recipient of the Jerry Van Dyke Memorial Award, recognizing outstanding contribution to motorsports by an individual.